OSIRIS clear filter image taken during the flyby of the Rosetta spacecraft at asteroid Lutetia on July 10, 2010. Asteroids are rocky worlds revolving around the sun that are too small to be called planets. They are also known as planetoids or minor planets. There are millions of asteroids, ranging in size from hundreds of miles to several feet across. In total, the mass of all the asteroids is less than that of Earth's moon. Despite their size, asteroids can be dangerous. Many have hit Earth in the past, and more will crash into our planet in the future. That's one reason scientists study asteroids and are eager to learn more about their numbers, orbits and physical characteristics. If an asteroid is headed our way, we want to know that. Asteroids are leftovers from the formation of our solar system about 4.6 billion years ago. Early on, the birth of Jupiter prevented any planetary bodies from forming in the gap between Mars and Jupiter, causing the small objects that were there to collide with each other and fragment into the asteroids seen today. Understanding of how the solar system evolved is constantly expanding. Two fairly recent theories, the Nice model and the Grand Tack, suggest that the gas giants moved around before settling into their modern orbits. This movement could have sent asteroids from the main belt raining down on the terrestrial planets, emptying and refilling the original belt. Asteroids can reach as large as Ceres, which is 940 kilometers (about 583 miles) across. On the other end of the scale, the smallest asteroid ever studied is the 6-foot-wide (2 meters) space rock 2015 TC25, which was observed when it made a close flyby of Earth in October 2015. The chances of it hitting Earth in the foreseeable future are small, Vishnu Reddy of the University of Arizona's Lunar and Planetary Laboratory said in a statement. "You can think of [an asteroid] as a meteorite floating in space that hasn't hit the atmosphere and made it to the ground — yet," Reddy added. Nearly all asteroids are irregularly shaped, although a few of the largest are nearly spherical, such as Ceres. They are often pitted or cratered — for instance, Vesta has a giant crater some 285 miles (460 km) in diameter. 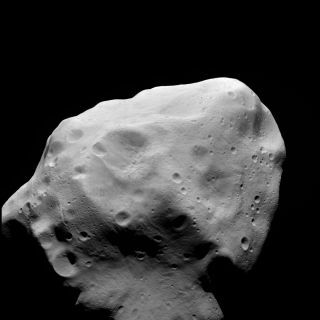 The surfaces of most asteroids are thought to be covered in dust. As asteroids revolve around the sun in elliptical orbits, they rotate, sometimes tumbling quite erratically. More than 150 asteroids are also known to have a small companion moon, with some having two moons. Binary or double asteroids also exist, in which two asteroids of roughly equal size orbit each other, and triple asteroid systems are known as well. Many asteroids seemingly have been captured by a planet's gravity and become moons — likely candidates include Mars' moons, Phobos and Deimos, and most of the outer moons of Jupiter, Saturn, Uranus and Neptune. The average temperature of the surface of a typical asteroid is minus 100 degrees Fahrenheit (minus 73 degrees Celsius). Asteroids have stayed mostly unchanged for billions of years — as such, research into them could reveal a great deal about the early solar system. Asteroids come in a variety of shapes and sizes. Some are solid bodies, while others are smaller piles of rubble bound together by gravity. One, which orbits the sun between Neptune and Uranus, comes with its own set of rings. Another has not one but six tails. Asteroids lie within three regions of the solar system. Most asteroids lie in a vast ring between the orbits of Mars and Jupiter. This main asteroid belt holds more than 200 asteroids larger than 60 miles (100 km) in diameter. Scientists estimate the asteroid belt also contains between 1.1 million and 1.9 million asteroids larger than 1 km (3,281 feet) in diameter and millions of smaller ones. Not everything in the main belt is an asteroid — Ceres, once thought of only as an asteroid, is now also considered a dwarf planet. In the past decade, scientists have also identified a class of objects known as "main belt asteroids," small rocky objects with tails. While some of the tails form when objects crash into an asteroid, or by disintegrating asteroids, others may be comets in disguise. Many asteroids lie outside the main belt. Trojan asteroids orbit a larger planet in two special places, known as Lagrange points, where the gravitational pull of the sun and the planet are balanced. Jupiter Trojans are the most numerous, boasting nearly as high a population as the main asteroid belt. Neptune, Mars and Earth also have Trojan asteroids. Near-Earth asteroids (NEAs) circle closer to Earth than the sun. Amor asteroids have close orbits that approach but no not cross Earth's path, according to NASA. Apollo asteroids have Earth-crossing orbits but spend most of their time outside the planet's path. Aten asteroids also cross Earth's orbit but spend most of their time inside Earth's orbit. Atira asteroids are near-Earth asteroids whose orbits are contained within Earth's orbit. According to the European Space Agency, roughly 10,000 of the known asteroids are NEAs. The C-type or carbonaceous asteroids are grayish in color and are the most common, including more than 75 percent of known asteroids. They probably consist of clay and stony silicate rocks, and inhabit the main belt's outer regions. The S-type or silicaceous asteroids are greenish to reddish in color, account for about 17 percent of known asteroids, and dominate the inner asteroid belt. They appear to be made of silicate materials and nickel-iron. The M-type or metallic asteroids are reddish in color, make up most of the rest of the asteroids, and dwell in the middle region of the main belt. They seem to be made up of nickle-iron. There are many other rare types based on composition as well — for instance, V-type asteroids typified by Vesta have a basaltic, volcanic crust. Ever since Earth formed about 4.5 billion years ago, asteroids and comets have routinely slammed into the planet. The most dangerous asteroids are extremely rare, according to NASA. An asteroid capable of global disaster would have to be more than a quarter-mile wide. Researchers have estimated that such an impact would raise enough dust into the atmosphere to effectively create a "nuclear winter," severely disrupting agriculture around the world. Asteroids that large strike Earth only once every 1,000 centuries on average, NASA officials say. Smaller asteroids that are believed to strike Earth every 1,000 to 10,000 years could destroy a city or cause devastating tsunamis. According to NASA, space rocks smaller than 82 feet (25 m) will most likely burn up as they enter Earth's atmosphere, which means that even if 2015 TC25 hit Earth, it probably wouldn't make it to the ground. On Feb. 15, 2013, an asteroid slammed into the atmosphere over the Russian city of Chelyabinsk, creating a shock wave that injured 1,200 people. The space rock is thought to have measured about 65 feet (20 m) wide when it entered Earth's atmosphere. For every known asteroid, however, there are many that have not been spotted, and shorter reaction times could prove more threatening. When asteroids do close flybys of Earth, one of the most effective ways to observe them is by using radar, such as the system at NASA's Goldstone Deep Space Communications Complex in California. In September 2017, the near-Earth asteroid 3122 Florence cruised by Earth at 4.4 million miles (7 million km), or 18 times the distance to the moon. The flyby confirmed its size (2.8 miles or 4.5 km) and rotation period (2.4 hours). Radar also revealed new information such as its shape, the presence of at least one big crater, and two moons. In a NASA broadcast from earlier in 2017, Marina Brozovic, a physicist at NASA's Jet Propulsion Laboratory, said radar can reveal details such as its size, its shape, and whether the asteroid is actually two objects (a binary system, where a smaller object orbits a larger object.) "Radar is a little bit like a Swiss army knife," she said. "It reveals so much about asteroids all at once." In the unlikely event that the asteroid is deemed a threat, NASA has a Planetary Defense Coordination Office that has scenarios for defusing the situation. In the same broadcast, PDCO planetary defense officer Lindley Johnson said the agency has two technologies at the least that could be used: a kinetic impactor (meaning, a spacecraft that slams into the asteroid to move its orbit) or a gravity tractor (meaning, a spacecraft that remains near an asteroid for a long period of time, using its own gravity to gradually alter the asteroid's path.) PDCO would also consult with the White House and the Federal Emergency Management Agency (FEMA) and likely other space agencies, to determine what to do. However, there is no known asteroid (or comet) threat to Earth and NASA carefully tracks all known objects through a network of partner telescopes. Ironically, the collisions that could mean death for humans may be the reason we are alive today. When Earth formed, it was dry and barren. Asteroid and comet collisions may have delivered the water-ice and other carbon-based molecules to the planet that allowed life to evolve. At the same time, the frequent collisions kept life from surviving until the solar system calmed down. Later collisions shaped which species evolved and which were wiped out. According to NASA's Center for Near Earth Object Studies CNEOS), "It seems possible that the origin of life on the Earth's surface could have been first prevented by an enormous flux of impacting comets and asteroids, then a much less intense rain of comets may have deposited the very materials that allowed life to form some 3.5 - 3.8 billion years ago." In 1801, while making a star map, Italian priest and astronomer Giuseppe Piazzi accidentally discovered the first and largest asteroid, Ceres, orbiting between Mars and Jupiter. Although Ceres is classified today as a dwarf planet, it accounts for a quarter of all the mass of all the known asteroids in or near the main asteroid belt. Over the first half of the 19th century, several asteroids were discovered and classified as planets. William Herschel coined the phrase "asteroid" in 1802, but other scientists referred to the newfound objects as minor planets. By 1851, there were 15 new asteroids, and the naming process shifted to include numbers, with Ceres being designated as (1) Ceres. Today, Ceres shares dual designation as both an asteroid and a dwarf planet, while the rest remain asteroids. Since the International Astronomical Union is less strict on how asteroids are named when compared to other bodies, there are asteroids named after Mr. Spock of "Star Trek" and rock musician Frank Zappa, as well as more solemn tributes, such as the seven asteroids named for the crew of the Space Shuttle Columbia killed in 2003. Naming asteroids after pets is no longer allowed. Asteroids are also given numbers — for example, 99942 Apophis. The first spacecraft to take close-up images of asteroids was NASA's Galileo in 1991, which also discovered the first moon to orbit an asteroid in 1994. In 2001, after NASA's NEAR spacecraft intensely studied the near-earth asteroid Eros for more than a year from orbit, mission controllers decided to try and land the spacecraft. Although it wasn't designed for landing, NEAR successfully touched down, setting the record as the first to successfully land on an asteroid. In 2006, Japan's Hayabusa became the first spacecraft to land on and take off from an asteroid. It returned to Earth in June 2010, and the samples it recovered are currently under study. NASA's Dawn mission, launched in 2007, began exploring Vesta in 2011. After a year, it left the asteroid for a trip to Ceres, arriving in 2015. Dawn was the first spacecraft to visit Vesta and Ceres. As of 2017, the spacecraft still orbits the extraordinary asteroid. In September 2016, NASA launched the Origins, Spectral Interpretation, Resource Identification, Security, Regolith Explorer (OSIRIS-REx), which will explore the asteroid Bennu before grabbing a sample to return to Earth. "Sample return is really at the forefront of scientific exploration," OSIRIS-REx principal investigator Dante Lauretta said at a press conference. In January 2017, NASA selected two projects, Lucy and Psyche, via its Discovery Program. Planned to launch in October 2021, Lucy will visit an object in the asteroid belt before going on to study six Trojan asteroids. Psyche will travel to 16 Psyche, an enormous metallic asteroid that may be the core of an ancient Mars-size planet, stripped of its crust through violent collisions. In 2012, a company called Planetary Resources, Inc. announced plans to eventually send a mission to a space rock to extract water and mine the asteroid for precious metals. Since then, NASA has begun to work on plans for its own asteroid-capture mission. According to CNEOS, "It has been estimated that the mineral wealth resident in the belt of asteroids between the orbits of Mars and Jupiter would be equivalent to about 100 billion dollars for every person on Earth today." U.S. Naval Observatory: When Did the Asteroids Become Minor Planets?